Browse the latest new homes by Spitfire Bespoke Homes nationwide. Spitfire Bespoke Homes is a privately owned housebuilder that specialises in building bespoke, sustainable and high-quality properties. A forward-thinking company, Spitfire designs and builds luxury homes that combine the latest interior trends with practical living. 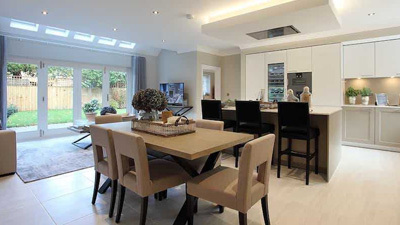 Design dictates this housebuilder, and it has grown rapidly since it was established in 2010. It currently has a range of properties available across the Midlands and the South East of England. The housebuilder has won numerous awards over the years, including several prestigious WhatHouse? Awards. In 2018, the company was awarded Gold at the WhatHouse? Awards for Best Development, and also took home Silver for Best Medium Housebuilder. Spitfire is funded by partner IM Properties. This means it has substantial cash resources available, allowing the housebuilder to really reach its potential with its residential development opportunities. IM Properties’ portfolio is currently valued at over £1bn. As well as ensuring high-quality design and construction of its properties, Spitfire is committed to providing an excellent level of customer service, designed to make your move into a new home as smooth and hassle-free as possible. Choose a Spitfire Bespoke Homes development in this area.